February 23, 1905 – A. C. Banker, the first chauffeur to be arrested for failure to display a license, is taken from his vehicle in front of the Auditorium Annex. Soon after detectives F. J. Shields and John Fitzpatrick arrest four more chauffeurs who are “speeding along the streets without numbers.” [Chicago Daily Tribune, February 24, 1905] All five pay a ten-dollar cash bond and are released. In the evening the draft of an automobile law is approved at a meeting of the Chicago Automobile Club with a plan to send it to Springfield within the week. It proposes a maximum of ten miles-per-hour on busy city streets and 14 miles-per-hour in “less settled districts.” Out in the country motorists may speed along at 20 miles-per-hour. There is a clause mandating the registration of vehicles with a fine of $50 for a third infraction and revocation of a motorist’s driver’s license for six months. Farmers “who drive leisurely along the country road and refuse to get out of the way for fast automobiles” will pay a fine of $25. 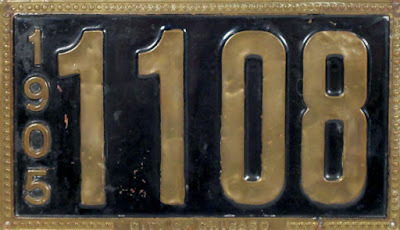 In a 2013 auction the Chicago license plate shown above sold for $1,100. February 23, 1955 -- A bid that tops Carson Pierie Scott & Co.'s offer for the 12-story building at the corner of State and Madison Streets is submitted in federal district court. The bid tops Carson's offer of $7,250,000 by over $350,000. The courts become involved because the building's owner, the Otto Young estate, had previously specified that the property could not be sold until ten years after the death of the youngest daughter in the family, who, at 77, is still very much alive. However, three weeks earlier a judge ruled that the courts had the right to authorize the sale. 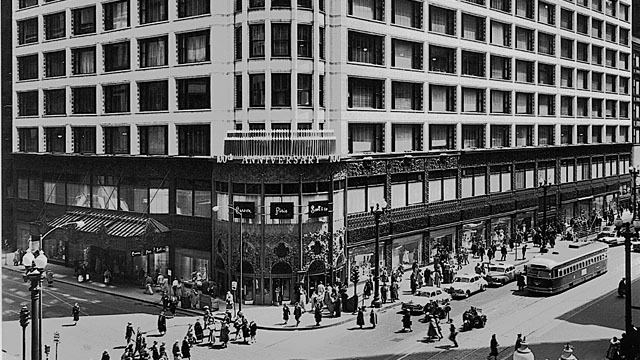 The building in question, now a Target store, is perhaps the one building in Chicago that best represents the genius of architect Louis Sullivan.